I present you with an early gift to commemorate this most holy of seasons...Easter! I placed this lot where the Wolf's property is in Sunset Valley. I changed the baptismal from what you see in the picture...It was a bathtub, but who wants their simmies stripping down in the middle of church! 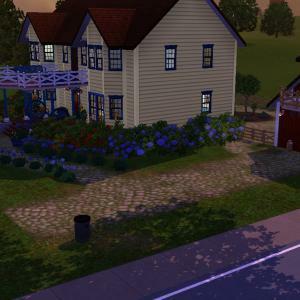 A lush landscape for your Sims to enjoy, complete with a fishing pond, horse stall, and a club house for the kids! I have 'Pets, Seasons, Supernatural, and Town Life Stuff' installed. There are free store items installed as well. 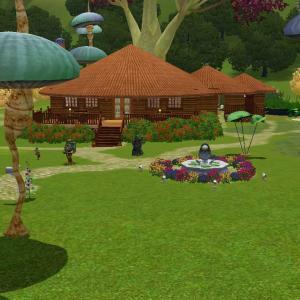 CC is minimal and includes some plants from Jope Living, and artwork from Sims Art Gallery (maxi's recolors)...Which will be replaced with similar objects in your game if you do not have these. I have Seasons, Pets, and Supernatural, but SN was not installed when I made this. There is no CC. I used the MoveObjects cheat to achieve many of the effects like creating the cabinets in the dining area. I have most of the free store items but I'm not sure if any are in this lot...I don't think there is. I didn't do much with the second story. I hope you enjoy this one...It is my favorite...reminds me of the old 'salt box' homes in New England. I test played a Sim through this lot, and found no problems. I am always concerned with the fireplaces catching on fire whenever I use the MO cheat with fireplaces...(sounds like an oxymoron)...But did not have any problems in my test game. Let me know if this is an issue with you. This lot is from Riverview. It's a great one to start a small family farm. This lot features my special dining cabinet that I make with the Move Object cheat, as well as the grandfather-type clock. Please forgive me, but I can't seem to remember whether I did anything with the second floor! It's been awhile since I played this one. Hope you enjoy lots of pattern and color. I placed the columns too close to the fireplace, and it caught on fire in my game. If you want to keep them, make sure you have a sim with the 'Handy' trait make the fireplace fireproof right away...otherwise you may want to remove the (4) columns from the fireplace! (They are back to back two on each side of it. )...Unless you like the drama that comes with a house fire in the game. 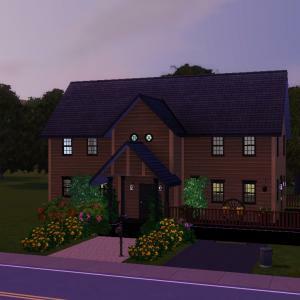 I hope you enjoy this new community lot in your sims 3 game, now that I learned how to make and share lots, there will be more to come! Hey guys! I'm back to uploading to SimSafe 2/3!!!! Today I'm here with a wonderful new home called the Classique Moderne. Classique means Classic in French. Moderne means Modern. What that means is, this house is modern, but at the same time, it has the classic furniture for elegance, and modern furniture for luxury. Comment (tell us your opinions on this house), or feedback! Unzip this to your Downloads (Documents/Electronic Arts/TheSims3/Downloads) folder. Launch TheSims3 Launcher. Go to Downloads. Check the box next to the home, press Install. Smithfield, designed by Jim Wells. This is my first Sims 3 upload. All the recolouring is done in the game. This was so much fun. I hope you enjoy playing this lot.